"Aussie" is an Austral Conure that is about 5 months old. Aussie was handfed and likes the company of people very much. He is very quiet and sweet tempered, and enjoys being held. The Austral Conure is favored as an excellent aviary bird as they are not obnoxious or overly noisy. They also make a sweet and loveable companion, with a quiet easy going disposition. They enjoy evening activity which makes them ideal for people who are home to interact with a pet later in the day. This conure is not as well known as many other conures, even its smaller cousin the Chilean Conure is more well known. This is probably because it was first bred in captivity in the East Berlin Zoo in the early 1970's. But more and more are being bred in captivity in the United States, and we should see them become more readily available. The Chilean Conure E. ferrugineus minor, is also from southwestern Argentina and Chili, though is generally found farther north. It is better known and a more readily available conure than the Austral Conure. It is a bit smaller than the Austral Conure, being 13 1/5" (34 cm), and is somewhat darker. It also has a darker head band and the belly patch often times disappears in the darker birds. The Chilean Conure also lays smaller clutches of eggs than its larger cousin. They originate from southern South America in lower Argentina and Chile. The Austral Conure is one of only two species in the Ericognatus genus. Along with the Slender-billed Conure Enicognathus leptorhynchus they are the most southerly distributed of all parrots. Also known as the Magellan Conure, the Austral Conure belongs to the parrot family. The plumage is mainly green with darkly edged feathers giving it a barred appearance. They have a forehead and eye stripe that are a dull reddish brown and the crown is slightly tinged with blue, There is a reddish brown patch on the belly and the outer wings are green tinged with blue along the edge.The tail is brownish red tipped with green. The beak is brown/black and the iris is reddish brown. On juveniles, the red markings on the forehead and the abdomen are duller and less extensive. 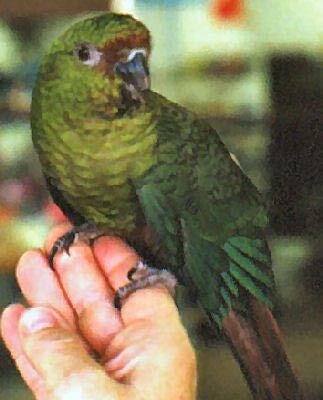 A mature Austral Conure is about 13 3/4 " (37 cm) long and weighs 4.9 ounces (139 g). The slightly smaller Chilean Conure is about 13 1/3" (34 cm). A roomy cage is required unless the bird is to be let out for extended periods. Many birds can spend most of their time on a play pen or parrot perch. A night shelter is recommended for this conure and will be greatly appreciated. A good sleeping box size is 24" x 19 1/2" x 17 34" (60x50x45 cm). The Austral Conure is also sensitive to drafts and drops in temperature. In the wild Austral Conures eat seed, fruits, berries, leaf buds, bulbous roots, grass seed, and acorns. They are seen in farmer's fields when the crops are ripening and have been know to cause considerable damage to farmlands from their feeding on the ripened grains. The Austral's main diet should primarily be seeds, fruits, and vegetables. A commercially prepared avian pelleted diet can also be beneficial. Because they like to forage seed on the ground, sprinkling additional seed on the cage bottom or the aviary floor is pleasing to them. Wild conures are friendly and peaceful. They live together in groups of 20 or more birds and seldom fight with each other. The Austral Conure is no exception and can be seen in flocks from as few as 10 birds to flocks of over 100 birds. In their natural environment, the Austral Conure nests in a tree hollow. The female lays quite a large clutch of four to seven eggs which are incubated for 21 to 27 days. The young leave the nest at six to eight weeks. The Chilean Conure has a smaller clutch and will lay between two to six eggs. This bird is not nearly as noisy as many of the conures. They are sensitive to, and could get ill from drafts and a drop in temperature. Availability: The Austral Conure is occasionally available, but not nearly as available as its better known cousin the Chilean Conure. Your best bet is to find one at a pet store or a reputable breeder. These type of conures are excellent companions. I myself have one and I'll never regret buying her. I recommend doing a lot of research about conures or any type of bird in that case. Although doing research and what not may be boring, trust me that it will pay off. I hate to say it but it's very common for people to just go out and get a bird thinking that it's a piece of cake :( . [It's not so easy to take care of any pet.] It breaks my heart when I hear about stories where people either give their pet to a shelter or even let it free outside to fend for its self :( . So please, if you put the time and effort into getting yourself a companion, like me you wont reget it :) . I was given a conure from a friend of my sisters. She told me that she rescued "Baby Bird" from a neighbor that had put "him" under a porch balcony in a caged area, where the wire was hit with rocks, shoes, sticks and whatever else. But she could no longer keep him because she had to move and no pets were allowed. I have read the info you have here on your website. He is not very sociable, but will take food from mine and my kids fingers, but not open hands (he shys away, like he is scared). We have never mistreated him nor intend to ever. However, he has a very HIGH pitch squack, that is ear piercing sometimes. I read here that they use that pitch if feel uncomfortable or insecure. We have had him for about a year now and he is still doing it. He does no tricks, but does attempt to make a noise at night ressembling a kiss somewhat when I cover his cage. Would you happen to have any suggestions as to how I can help him feel more secure and tone done his pitch. Thank you very much for your time. Janet Gibson P.S. We even have other birds that are in the same area he is located and that he can associate with. Conures are notorius for making noise. They are very expressive so watch him and eventually he will make sure his human is trained. You can feed him with your fingers so try and get him to come into the palm of your hand by placing the treat in your palm. Alternative is to just grab him like you would a kitten and hold him to your heart. When he settles, gently pet the top of his head and sides of his face. His feathers will fluff up. Be patient and go slow. Sounds like he is hand shy. Possibly because he never learned or somehow was frightened. They are smart birds and react to affection. They are strongly bonded to their human so just try and hold the little fella. Thank you for your beautiful site with so many different conures. For years I have been wondering what type of conure I bought years ago. When I bought "Harvey" the pet store people really had no idea what it was- they told me "she"(I never had her sexed so she might have been a he ) was a maroon bellied or a green cheek.I had Harvey for about 4 years and I have never had so much fun with a bird in my life. Her favorite thing to do was to fly from her cage first thing in the morning and land on my dad's head (he was bald so the landings left a little to be desired lol) then climb down to his shoulder and clean his ears. After she had done that she would watch my dad's hand, waiting for him to raise his coffee mug to get a sip of coffee. Imagine his surprise the first time he got a mouthful of Harvey's feathered head instead of coffee. She was also known to unlock her cage and chase any cats that got to close- I think she was a hawk in a past life! Thank you again.